Melanoma in situ is not a life threatening lesion. The challenge with melanoma treatment is that within some lesions diagnosed as melanoma-in-situ there may be foci of invasive melanoma. This is the essence of why complete surgical excision of melanoma-in-situ is necessary. Ruling out an invasive component within a melanoma-in-situ is the cornerstone of management of these lesions. The second important reason for treating melanoma-in-situ is the risk of degeneration of an in-situ melanoma into an invasive melanoma. The risk has been estimated from 5-10% over a patient’s lifetime. Some judge the risk to be 2-3% per decade of life of degeneration into an invasive melanoma. What is fascinating about melanoma-in-situ developing invasive components, is their relatively low metastatic risk. Unlike de novo invasive melanomas, the invasive melanomas originating in melanoma-in-situ appear to be less aggressive. Some older studies from Europe have tracked the natural history of a population of melanoma-in-situ. These have shown evidence of transformation into invasive melanomas and evidence of recurrence, but no described incidents of mortality due to invasive melanoma degeneration. True statistics of mortality from invasive melanomas are hard to assess given that almost every melanoma-in-situ is treated. Given that relative lack of aggression, it seems prudent to treat melanoma-in-situ less aggressively. Contact our Newport Beach Clinic for help determining the appropriate procedure. Diagnosis of melanoma-in-situs are frequently made clinically from irregularly spreading pigmented lesions with asymmetric borders and variable colors. 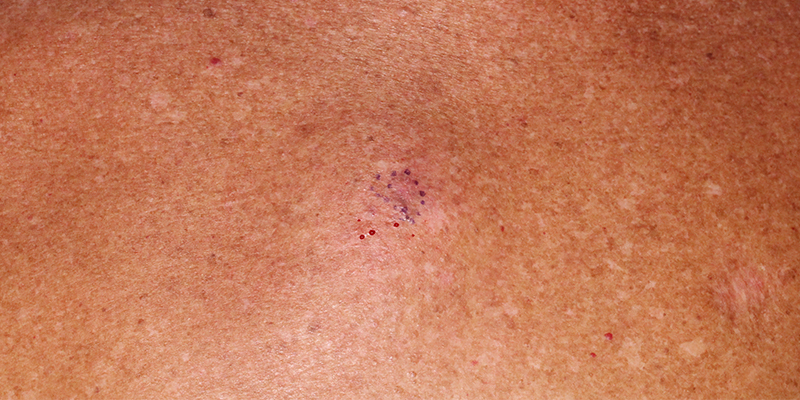 A biopsy of this pigmented lesion simply establishes that at least the biopsied portion of the lesion is melanoma-in-situ. After that, complete excision is necessary to rule out a component of invasive melanoma within the melanoma-in-situ. An alternative to excision for comprehensive diagnosis is multiple punch biopsies with special attention to the darkest areas of the lesion. Complete excision of a melanoma-in-situ is the ultimate diagnostic procedure. Shave biopsies of melanoma-in-situ are not appropriate as they preclude evaluation of the full depth of the lesion. On histology, melanoma-in-situ is a full thickness involvement of the epidermis above the basement membrane with atypical melanocytes. Atypical melanocytes also track the dermal appendages deep into the dermis still staying above the basement membrane. Shave biopsies can be erroneously read showing invasion if one of these dermal appendages (sebaceous glands, apocrine glands, or hair follicles) show atypical melanocytic cells as an island within the dermis. To confirm this as an extension of melanoma-in-situ, a full thickness biopsy is required. Decision making in surgical treatment is not straightforward. Guidelines for excision have included excision margins of 5 to 9 mm around the visible pigmented edge. However even with wider margins of resection, recurrences of melanoma-in-situ at those margins occur. This is due to extensive spread of atypical melanocytes beyond the visible margin of the lesion in some cases. Because these lesions are the result of sun damage and genetic predisposition, they can present as widely spreading lesions, especially in the elderly, with indistinct borders. Most melanoma-in-situ are curable with at least a 5 mm margin of excision. The surgical management of melanoma-in-situ occasionally includes excision of the lesion with delayed reconstruction to allow for histologic evaluation of margins. If margins are found to be involved then additional excision could be performed within a few days or at the time of the reconstruction of the defect. This is the most common scenario with large lesions. Mohs excision has also been used for treatment of melanoma in situ, but even with Mohs excision clear margins are still uncertain due to difficulty of seeing atypical melanocytes on frozen sections. Mohs excision is a good alternative where the margins are too indistinct for visual identification. An alternative to Mohs excision of poorly visualized margins of melanoma in situ are mapping biopsies. This is a series of multiple punch biopsies through the lesion and beyond margins to define the true margins of the lesion. Melanoma in situ can involve cosmetically sensitive areas such as nasal tip and ala, and eyelid margin. Treating these areas with 5mm margins can result in significant defects requiring highly complex reconstruction. In such cases, surgeons may choose to treat with narrower margins of excision to spare the patient functional impairment and extensive reconstructive surgery. Such cases require close follow up for recurrence. And if the lesion recurs, smaller additional excisions can be performed at a later time. An adjunctive treatment when margins are not clear is imiquimod. This is used for several months after excision with a hope of curing any residual atypical melanocytes. An alternative treatment to melanoma in situ is superficial radiotherapy or hospital based radiation. These lesions are responsive to and curable with radiation therapy. Planning radiation fields would require a visible margin of a melanoma in situ or documented mapping biopsies showing the margin of the lesion. On histology, melanoma-in-situ is a full thickness involvement of the epidermis above the basement membrane with atypical melanocytes. Atypical melanocytes also track the dermal appendages deep into the dermis still staying above the basement membrane. Shave biopsies can be erroneously read showing invasion if one of these dermal appendages (sebaceous glands, apocrine glands, or hair follicles) show atypical melanocytic cells as an island within the dermis. To confirm this as an extension of melanoma-in-situ, our Orange County experts will require a full thickness biopsy.